It's the components surrounding the running backs that make them great. Rather than selecting a potential franchise quarterback, the New York Giants spent the No. 2 overall pick in the 2018 NFL draft on running back Saquon Barkley. Barkley did not disappoint, putting together one of the best rookie seasons in league history. The Penn State product led the league with over 2,000 scrimmage yards and ranked third in football with 15 touchdowns. The Giants finished dead last in the NFC East with five wins. In that same draft, the Seattle Seahawks — desperate for a boost in the backfield — rolled the dice on a running back in Round 1 when they selected Rashaad Penny 27th overall. And indeed, Seattle’s rush offense improved immensely in 2018. In fact, the Seahawks ranked No. 1 in the NFL in rushing. It’s a big reason they got back to the playoffs despite suffering significant losses on defense. Penny was the team’s third-leading rusher, behind second-year seventh-round pick Chris Carson and fourth-year fourth-round selection Mike Davis. The San Diego State product accounted for just 16 percent of his team’s rushing yards. First-round rookie back Sony Michel has experienced plenty of success in the New England Patriots’ offensive backfield, but so have James White, Rex Burkhead, and even Cordarrelle freakin’ Patterson. Like Penny and the five running backs drafted on Day 2, he fell short of 1,000 yards. That doesn’t mean Michel isn’t becoming a great player, or that Penny and second/third-round backs Nick Chubb, Ronald Jones, Kerryon Johnson, Derrius Guice, and Royce Freeman won’t become great as well. Barkley already is great, and Michel, Penny, Chubb, Johnson, and Freeman had nice moments as rookies. But we continue to get proof that top-notch running backs either don’t make enough of a difference (see standouts like Barkley, Joe Mixon, and Christian McCaffrey, all of whom ranked in the top 10 in rushing as part of losing teams in 2018), bust entirely (paging Leonard Fournette, Trent Richardson, Ameer Abdullah, and quite possibly already Ronald Jones), or turn out to be easily replaceable (Penny is this year’s poster child). The replaceability factor deserves more attention. The Penny situation wasn’t a fluke — you could see it coming from a mile away. Seattle’s running game didn’t take off because Penny was added to the fray or even because Carson improved immensely in his first full offseason. That running game succeeded mainly because the Seahawks finally threw a half-decent offensive line onto the field, and because new offensive coordinator Brian Schottenheimer’s system emphasized the run in new and unique ways. It should be noted that the Giants offensive line also had more talent this season than in any other year since their last Super Bowl run. And they also hired a head coach — Pat Shurmur — who did everything in his power to make plays for Barkley within his power spread offense. To more of an extent than most fans want to believe, running backs are products of their environment. If you have a good quarterback who can stretch out opposing defenses, or if you play in a run-friendly offensive system, or if you have a strong offensive line, you’re likely to experience a lot of success on the ground, regardless of where you’re drafted. Just look at the Kansas City Chiefs, who have all of those ingredients. Entering 2017, Kansas City looked like it had a solid back in Spencer Ware. But then Ware suffered a major knee injury, forcing the Chiefs to go to rookie third-round pick Kareem Hunt. Behind the league’s highest-rated (and suddenly aerial-oriented) passer, under the tutelage of offensive mastermind Andy Reid, and with stellar run-blocking from standout offensive linemen Laurent Duvernay-Tardif and Mitchell Schwartz, Hunt immediately won the NFL rushing title. With the offense looking even stronger, Hunt was experiencing another fantastic sophomore campaign before off-field problems abruptly ended his season, his tenure with the Chiefs, and possibly his career as well. What happened next? Um, the league’s top offense didn’t miss a friggin’ beat. Ware stepped back in and compiled 129 scrimmage yards on 20 touches in his second start. Then he got hurt, and fifth-year undrafted third-stringer Damien Williams stepped in. Thirty-three running backs had 40 or more rushes in December, but only five had higher yards-per-attempt averages than Williams, who rushed for 129 yards in Kansas City’s divisional-round cake walk over the Indianapolis Colts. Ranked No. 1 on that list of most productive backs in December? C.J. Anderson, who rushed for 299 yards and two touchdowns on 43 carries in place of “MVP candidate” Todd Gurley in Weeks 16 and 17. Gurley returned from a knee injury in the divisional playoffs, but he was out-gained by Anderson. To be clear, Anderson only joined the Rams five weeks ago when the team needed a body because of Gurley’s injury. He was a free agent because nobody in the NFL wanted him — not even the Oakland Raiders, who released him earlier in December after a six-day stint on their roster. The Rams don’t need Gurley because they’ve got Sean McVay, Jared Goff, Andrew Whitworth, Rob Havenstein, and Rodger Saffold. Just like the Chiefs don’t need Hunt because they’ve got Reid, Patrick Mahomes, Tyreek Hill, Travis Kelce, and linemen like Schwartz. And while we’re at it, the Pittsburgh Steelers don’t need Le’Veon Bell because they’ve got Ben Roethlisberger, Antonio Brown, JuJu Smith-Schuster, and a dominant offensive line. Bell tried to prove a point by sitting out the entire season. His replacement, second-year third-round pick James Conner, averaged 113 scrimmage yards per game in a Pro Bowl season. The Steelers offense averaged more points and yards per game with Conner in 2018 than it did with Bell in 2017. Those teams aren’t smart for scooping up players like Williams, Anderson, and Conner. They’re smart for hiring smart people, who in turn have installed productive offenses and signed high-quality players at more important positions. In Seattle’s case, they did all of those other things but made the mistake of also falling in love with a running back early in the draft. And the Denver Broncos committed a similar error simply by using a third-round pick on Freeman, who was dramatically outplayed by undrafted rookie Phillip Lindsay in 2018. But even if you want to give all the credit to replacement backs like Anderson, Williams, Carson, Conner, and Lindsay, that still supports the idea that early-round running backs are a waste. Either backs owe most of the credit for their success to those surrounding them, or successful backs grow on trees. Giants fans might have to come to grips with concept that Barkley can’t make their offense successful. 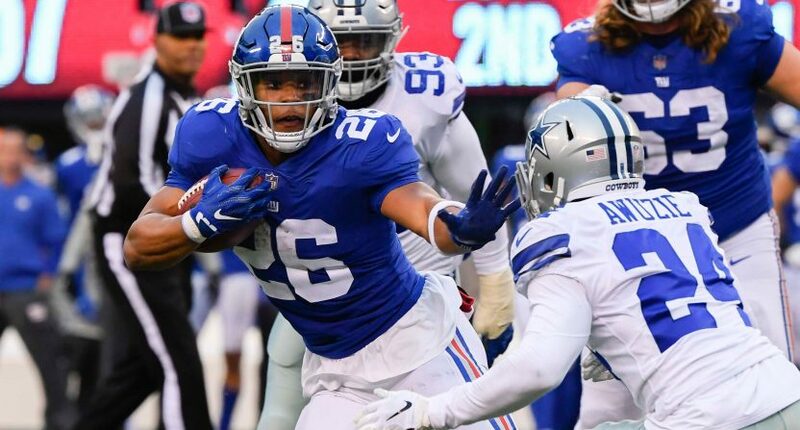 He has succeeded in spite of some offensive deficiencies in New York, but there’s only so much more he can do, and the Giants offense couldn’t possibly be dramatically worse without him. Pre-Barkley Giants backs like Orleans Darkwa, Andre Williams, David Wilson, and Shane Vereen are generally viewed as failures, but it’s entirely possible they would have succeeded in a better, more supportive offensive environment. The key is to build that environment. You do that by finding an innovative, forward-thinking offensive coach, by swinging the bat until you’ve found a franchise quarterback, and by investing heavily in the offensive line. Do that and the backs will suddenly emerge, regardless of where you found them. Just look at the Indianapolis Colts, who haven’t drafted a running back before the fourth round this decade. Until this season, the Indianapolis running game was terrible for pretty much all of that stretch, and it would have been easy to point a finger at the front office for ignoring the position in the draft. But it appears Indy knew then — Ryan Grigson’s ridiculous 2013 trade for Trent Richardson notwithstanding — that the problem was they didn’t have those other ingredients. If it wasn’t the bad offensive line, it was the injured quarterback or questionable systems run by Pep Hamilton/Rob Chudzinski. But they invested heavily in the line, Andrew Luck finally fixed his shoulder, and Frank Reich brought a new offensive approach to Indianapolis. The result? Young middle-round backs Marlon Mack and Jordan Wilkins combined for over 1,000 yards and averaged a tremendous 4.9 yards per carry in a platoon with rookie afterthought Nyheim Hines. Two weeks ago, those three combined for 127 rushing yards on 27 carries in a blowout road playoff victory over a Houston Texans run defense that ranked No. 1 in the NFL in terms of DVOA. They’re all replaceable, they’re all cheap, and they didn’t cost their team dearly in the draft. That’s ideal considering that the running back position has the shortest shelf life and one of the highest bust rates in the sport, and that in this era nearly 60 percent of all plays are passes. Decision-makers are catching on. They’ve picked up on the fact a team with a first-team All-Pro running back hasn’t won the Super Bowl this century, and the fact that only two of this century’s 18 Super Bowl-winning teams (Baltimore and Seattle) even had a Pro Bowl back on their roster. But too many teams are still falling in love with dazzling players at a position that hardly matters. Time to wake up and realize that while great teams often make mediocre running backs look great, great running backs almost never make mediocre teams look great.